The Global Volcanism Program has no activity reports for Ecuador. The Global Volcanism Program has no Weekly Reports available for Ecuador. The Global Volcanism Program has no Bulletin Reports available for Ecuador. Volcán Ecuador straddles the equator at the NW end of Isabela Island. 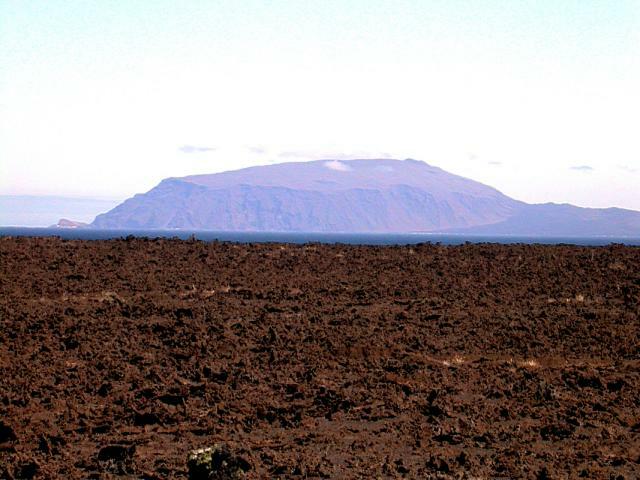 The western side of the volcano, the smallest of the six large shield volcanoes on the island, is broadly breached by edifice collapse, and youthful lava flows cover much of the caldera floor. 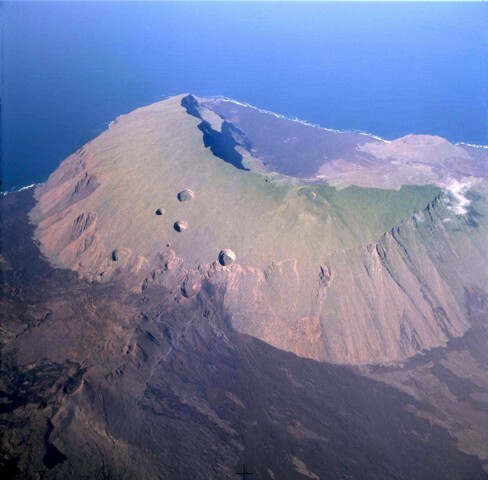 Two large pyroclastic cones were constructed along the coast, and several chains of spatter cones and small scoria cones cross the caldera floor, which has a prominent bench on its southern side. A single dark-colored aa lava flow covers about half of the caldera floor. A number of young lava flows reach the coast to form Cape Berkeley, W of a large youthful-looking tuff cone. Extending from the outer eastern flanks of the main edifice is a line of NE-trending fissure-fed vents that connect Volcán Ecuador (also known as Cape Berkeley volcano) with Volcán Wolf. The only Isabela Island volcano without historical eruptions, the youthful morphology of its most recent lava flows nevertheless resembles those of very recent flows on other Isabela Island volcanoes. Geist D, White W M, Albarede F, Harpp K, Reynolds R, Blichert-Toft J, Kurz M D, 2002. Volcanic evolution in the Galapagos: the dissected shield of Volcan Ecuador. Geochem. Geophys. Geosyst., 3(10): 1-32. Rowland S K, Munro D C, Perez-Oviedo V, 1994. Volcan Ecuador, Galapagos Islands: erosion as a possible mechanism for the generation of steep-sided basaltic volcanoes. Bull Volcanol, 56: 271-283. Simkin T, 1976. (pers. comm.). There is no Deformation History data available for Ecuador. There is no Emissions History data available for Ecuador. An aerial view from the NE shows Volcán Ecuador with its large caldera breached to the SW. Erosion has extensively modified the lower outer flanks of the volcano. East flank fissures at the lower left feed fresh lava flows, and large pit craters dot the upper eastern flank of the volcano. 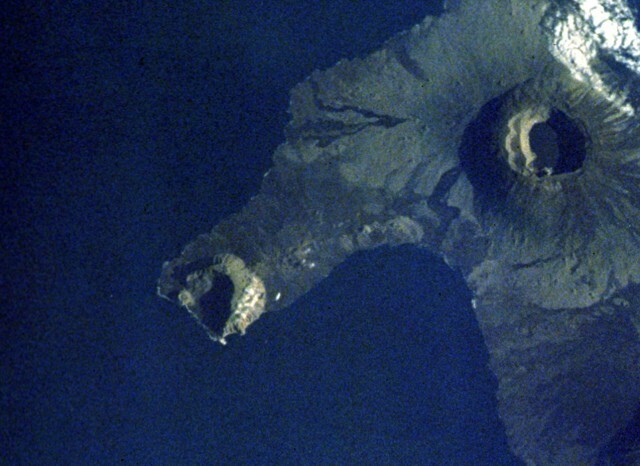 A large pyroclastic cone constructed on the floor of the caldera can be seen near the coast at the upper right, and fresh lava flows blanket the caldera floor. An aerial view of Volcán Ecuador from the south shows the large horseshoe-shaped caldera breached to the west that was formed when the volcano collapsed, producing a large submarine debris avalanche. 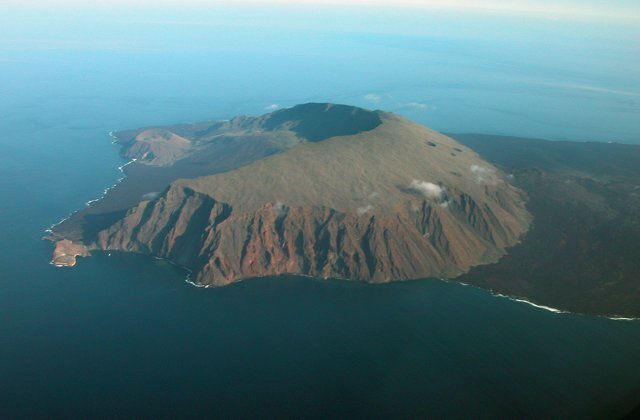 The volcano straddles the equator at the NW end of Isabela Island. 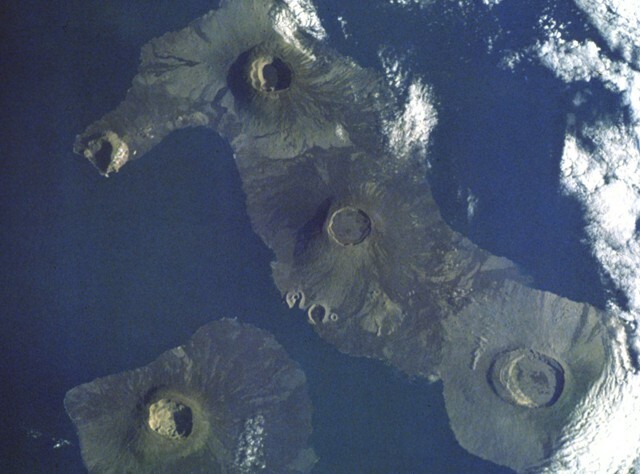 Two large pyroclastic cones were constructed along the coast, and smaller cones are found on the caldera floor. Extensive dark-colored lava flows (right) originate from a NE-trending line of fissures that extends from the outer eastern flanks of the main edifice. The Global Volcanism Program has no maps available for Ecuador. Large Eruptions of Ecuador Information about large Quaternary eruptions (VEI >= 4) is cataloged in the Large Magnitude Explosive Volcanic Eruptions (LaMEVE) database of the Volcano Global Risk Identification and Analysis Project (VOGRIPA).